Here’s another difference between the revolution in Wisconsin and the one in Egypt: Mubarak sent thugs into the middle of peaceful demonstrations to intimidate and maim his opponents. Gov. Scott Walker didn’t. Oh, he thought about it, rolled it over on his tongue, but finally decided against—not because it was wrong, but because it might backfire. 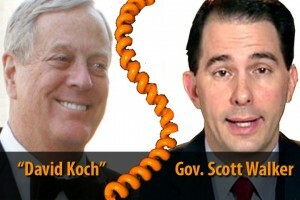 Walker was the victim of a prank phone caller who fooled the governor into thinking he was billionaire industrialist and big time political contributor David Koch. Koch impersonator: We’ll back you any way we can. What we were thinking about the crowd was, uh, was planting some troublemakers. We thought about that. My only fear would be if there were a ruckus caused is that would scare the public into thinking maybe the governor has got to settle to avoid all these problems. Impersonators brought down ACORN and damaged Planned Parenthood. Has one just mortally wounded Gov. Walker and his anti-union campaign? You don’t have to be an ethicist to be horrified that he would consider for a second sending thugs into a peaceful mass demonstration Stay tuned. This entry was posted on February 24, 2011 at 12:02 am and is filed under Ethics-general, Government, Politics. You can follow any responses to this entry through the RSS 2.0 feed. You can leave a response, or trackback from your own site. Unethical scum! Good call Bob!